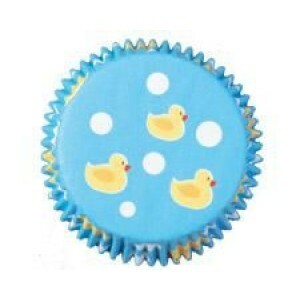 A Pack of approximately 75 blue rubber duckie themed cup cake cases. 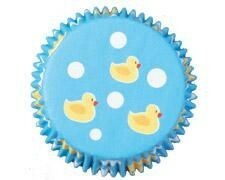 Cup cakes make a lovely table centre piecec when arranged on a stand plus are a great idea to give to your guests as baby shower favours. Cases are approximately 2" in diameter and are made from microwave safe paper.